A villa miseria (Spanish pronunciation: [ˈbiʃa miˈseɾja]), or just villa, is a type of shanty town or slum found in Argentina, mostly around the largest urban settlements. The term is a noun phrase made up of the Spanish words villa (village, small town) and miseria (misery, dejection), and was adopted from Bernardo Verbitsky's 1957 novel Villa Miseria también es América ("Villa Miseria is also [a part of] the Americas"). These shantytowns are euphemistically called asentamientos ("settlements") or villas de emergencia ("emergency villages"). In most parts of Argentina, the non-modified word villa usually refers to a villa miseria. These settlements consist of small houses or shacks made of tin, wood and other scrap material. Generally, the streets are not paved and narrow internal passages connect the different parts. The villas miseria have no sanitation system, though there may be water pipes passing through the settlement. Electric power is sometimes taken directly from the grid using illegal connections, which are perforce accepted by suppliers. The villas range from small groups of precarious houses to larger, more organized communities with thousands of residents. In rural areas, the houses in the villas miserias might be made of mud and wood. 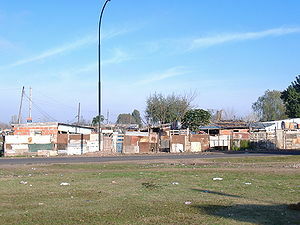 Villas miseria are found around and inside the large cities of Buenos Aires, Rosario, Córdoba and Mendoza, among others. The villas draw people from several backgrounds. Some are local citizens who have fallen from an already precarious economic position. In most cases, a villa miseria is populated by the children and grandchildren of the original settlers, who have been unable to improve their economic status. 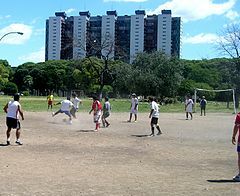 Improvised football match in a FONAVI development in Villa Lugano, Buenos Aires. The agency has put up over a million housing units since 1972. According to July 2004 estimates, there were about 640 "precarious neighborhoods" in suburban Buenos Aires, comprising 690,000 residents and 111,000 households. 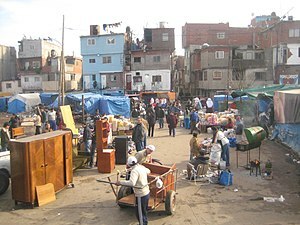 The population of the villas miseria in the city of Buenos Aires doubled during the 1990s, reaching about 120,000 as of 2005. By 2011, there were over 500,000 people living in more than 800 informal settlements around the periphery of Buenos Aires. Research from an NGO called 'A roof for my country' (UTPMP) found that of these settlements, 66% had been founded in the last fifteen years and 65% were still growing. Most slums (85%) had no sewage facilities and a similar percentage had no access to gas. The Government's statistics agency (INDEC) announced in 2016 that 8.8 million people, or 32.2% of the population, was living in poverty. This was a dramatic leap in numbers from the 4.7% people living in poverty just three years before. The non-profit TECHO estimated there more than 1,000 informal settlements in greater Buenos Aires in 2015. It stated that only 10% of villas had access to running water and 5% to sewage infrastructure. Attempting to address the housing problem, de facto President Alejandro Lanusse established the National Housing Fund (FONAVI) in 1972. An amalgam of long-standing national housing programs and lending facilities previously managed by the National Mortgage Bank, the FONAVI helped coordinate slum clearance efforts and, since then, has put up over 25,000 housing units a year (both single-family and multi-family types). Granting deeds on a lease-to-own basis, the fund mostly provides for households in Argentina's lowest income bracket and, thus, has historically had a collection rate of less than five per cent. The fund, one of the most important in Latin America, is largely underwritten by national fuel and other excise taxes. The military junta which ruled Argentina between 1974 to 1983 in the Dirty War attempted to destroy the informal slums by forcibly resettling people, which only succeeded in moving the villas miseria to new locations. More recently, Mayor of Buenos Aires Horacio Rodriguez Larreta intends to regularize all the informal settlements by 2023. Villa 1-11-14 is an informal settlement in the Flores area of Buenos Aires of about 70,000 people. The average lifespan is 24 years, compared to 40 elsewhere in the city. Some streets are controlled by drug-dealing gangs. Villa 31 is a large villa miseria in Buenos Aires, close to Retiro, the central train station. It dates from the 1930s and in 2017 had around 40,000 inhabitants. The city council plans to renovate the area by 2020, by improving housing, offering the opportunity for people to become home owners and connecting electricity, water and sewage facilities. The $320 million plan, financed by the World Bank and the Inter-American Development Bank, aimed to resettle sqautters into 1,350 new homes. At least 30 percent of the residents were concerned that they would not be rehoused. Prejudice has a lot to do with the coverage of mainstream media. According to the media, there are only thieves and murderers inside a villa. But 90 percent of those who live there are normal people, who work and send their kids to school, like everywhere else. And like everyone else, they want better living conditions. Mundo Villa is a TV station, a radio channel (Mundo Sur), a magazine issued monthly and a website. It is an independent media project which aims to provide villa miseria inhabitants with a voice and also to supply them with quality news. Adam Ledezma, a community activist from Villa 31, was keen to have a local newspaper and helped the project with villa-based journalism until he was murdered in 2010. Inspired by Mundo Villa, another new magazine La Garganta Poderosa ('The Mighty Throat') was set up in 2011. Argentinian painter Antonio Berni dealt with the hardships of living in a villa miseria through his series Juanito Laguna, a slum child, and Ramona Montiel, a prostitute. César Aira published his novel La Villa in 2001 (released in English translation in 2013 as Shantytown). In it he examines the invisibility of slumdwellers. Wikimedia Commons has media related to Villa miseria. ^ a b c d e f Caselli, Irene (16 January 2015). "Fighting for Basic Services, and News, in the Slums". Citylab. Retrieved 24 April 2019. ^ a b "Half a million families live in Buenos Aires slums and keep expanding vertically and horizontally". Mercopress. 7 October 2011. Retrieved 24 April 2019. ^ Rivas Molina, Federico (29 September 2016). "Latest figures show one in three Argentineans lives in poverty". El Pais. Retrieved 24 April 2019. ^ a b A World Bank country study (1993). Argentina - From insolvency to growth (English). Retrieved 24 April 2019. ^ a b c Calatrava, Almudena (17 May 2017). "Argentine capital seeks to improve iconic Villa 31 slum". Seattle Times. Retrieved 24 April 2019. ^ Centenera, Mar (6 March 2017). "The Buenos Aires slum fighting to save its youngsters from drug dealers". El Pais. Retrieved 24 April 2019. ^ Tobar, Hector (22 November 2013). "In 'Shantytown,' César Aira gives shape to the invisible". LA Times. Retrieved 24 April 2019. ^ Pezzini, Hugo (2013). The Latin American Literature of the Neoliberal Crisis: The Emergence of a Postmodern Post-hegemonic Heterotopy. (in Spanish) El derecho a la vivienda en Argentina[permanent dead link], Informe misión de investigación, Centre of Housing Rights and Evictions, 2004.